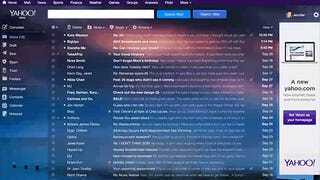 Marissa Meyer's parade of progress is continuing at Yahoo with a very sparkly redesign of Yahoo Mail. It's got all things that are good, including more storage and cleaner navigation and threaded conversations. Frankly, this redesign does pretty much anything to make Yahoo Mail look more like Gmail. The similarity smacks you in the forehead. It's not like Yahoo Mail got tons of new features stolen from Gmail. (It has a few.) It's just something about the spacing of the text and alignment of the page that screams Gmail. The only thing that would make the new Yahoo Mail look more like Gmail would be a little Gmail logo in the upper lefthand corner. It's also taking a lot of cues from iOS 7, including the controversial frosted glass effect and the Helvetica Ultra Light typeface. New features include a terabyte of storage, a Flickr-powered theme generator, the ability to expand threads in the inbox, some handy new navigation shortcuts like a button next to an email address that shows you all the messages from that person and, finally, a slick new compose screen that pops up over the inbox, just like in Gmail. Even the overhauled Yahoo Mail mobile app looks like the Gmail mobile app.